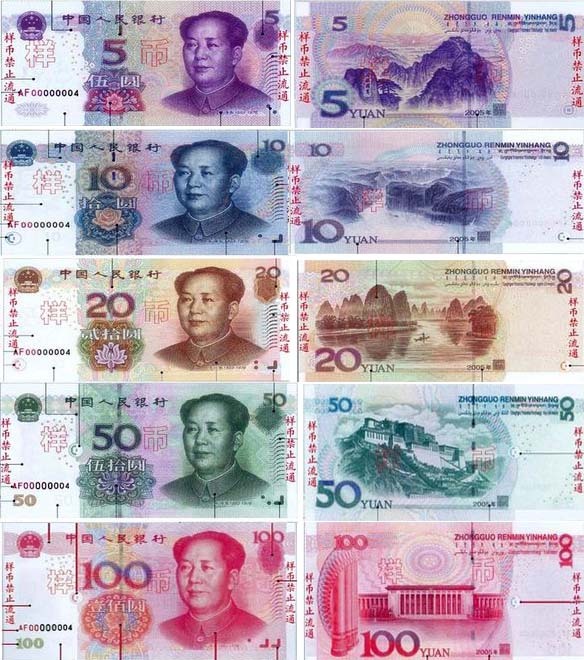 Remark: Colloquially in Chinese, the Yuan is often called kuai, and the Jiao is called mao. Currently China Money in use is China’s fifth edition of Chinese currency ( 1999 – 2005) circulating from 1999. The paper money in is 100 Yuan, 50 Yuan, 20 Yuan, 10 Yuan, 5 Yuan, 1 Yuan, 5 Jiao and 1 Jiao. You can exchange traveler’s checks or cash at most banks, and hotels always have a money exchange counter. You can also get a cash advance on your American Express card, but for this you need to go to the Bank of China headquarters at Fuchengmen or Bank of China Beijing Branch at Chaoyangmen or the one at your nearest branch of Bank of China. It is possible to receive counterfeit money while traveling China. So it is advisable to know to how to identify the fake money. The fifth edition of Chinese currency has a watermark on the left front side. You can easily recognize it against the light. There is a golden security line in the middle of RMB100, RMB50, RMB20, RMB10 and RMB5. The color of RMB notes is hard to imitate, and counterfeit bills are usually too fuzzy, that is, the images and colors are not so sharp.